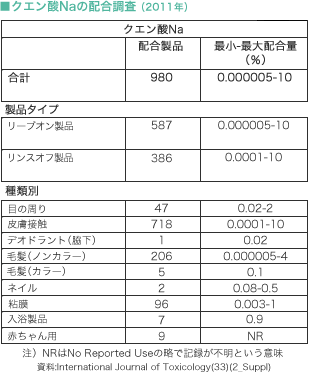 Cosmetic Ingredient Review（2014）「Safety Assessment of Citric Acid, Inorganic Citrate Salts, and Alkyl Citrate Esters as Used in Cosmetics」International Journal of Toxicology(33)(2),16S-46S. 田村 健夫, 他（1990）「皮膚収れん剤」香粧品科学 理論と実際 第4版,246-247. 田村 健夫, 他（1990）「酸化防止剤」香粧品科学 理論と実際 第4版,221-226.